Jehst is widely recognised as one of the UK’s most influential hip hop artists. Jehst has toured alongside hip hop pioneers KRS One and De La Soul, as well as Dubstep super-stars Skream and Benga. And if Pharoahe Monch calls himself a fan, that’s a definite plus! M-Phazes is anything but a newcomer to Australia’s Hip Hop scene, having worked as the go-to producer with giants such as Bliss N Eso and Obese Records. 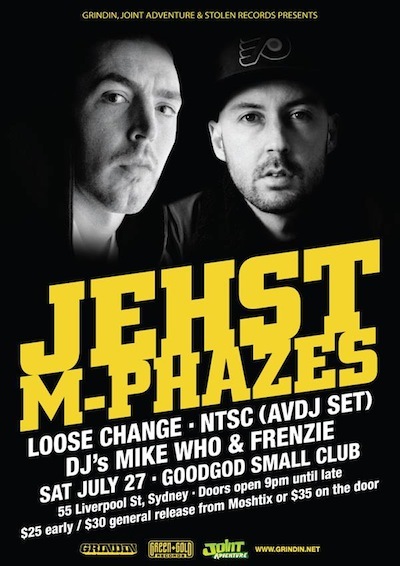 Together, Jehst and M-Phazes will blast a bunch of old tracks as well as showcase their new material.